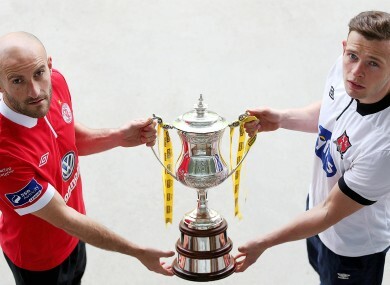 Our man on all things SSE Airtricity League says he can’t wait for this weekend’s Setanta Sports Cup final between Dundalk and Sligo Rovers. Sligo Rovers captain Alan Keane with Dundalk's stand-in skipper Andy Boyle. THE SETANTA SPORTS Cup final is just four days away and there aren’t two other teams I’d like to see contest it right now. Dundalk showed a good response to their defeat to Bray and the loss of captain Stephen O’Donnell to injury by defeating Cork in a comprehensive 4-0 win on Friday night. With the exception of that loss to the Seagulls, momentum is with them and has been since last season when they just came up short and finished runners-up. They went on to sign some very good players in the off-season, although I felt they could have strengthened a bit better in defence. But the club is definitely going places and now they’ve got a Setanta Cup final to look forward to. It’s hard to get away from the fact that it has been a weakened competition this year but you can’t be critical of Dundalk or Sligo who have done their stuff by beating some good teams along the way and both deserve to be contesting for silverware this Saturday. At the end of the day, a trophy is a trophy and it can have a very positive effect on a team. One thing that I noticed about the Cork win was that they tried to move the ball fast and play it into pockets between the defence and midfield. To be able to do that you’ve got to have technically good players, which they have. But what impressed me against Cork is that they were able to move the ball so well on a sub-standard pitch. You could see the ball hopping up after some difficult bounces but they coped very well and showed they can play the same way whether it’s on a grass pitch which is like a carpet or a below-par all-weather surface. Looking at Cork, they seem to be a bit tired mentally at the moment when you consider the nature of goals they conceded. They jumped to the top of the table at the start of the season with some talented but inexperience players and that can be draining on a team especially in a place like Cork where there is a huge buzz and expectation around. Sligo have got themselves out of the bad patch they had early on in the season and have the experience of winning major trophies in recent years. When you get that feeling, you just to do it again. It may seem a bit simplistic but, in my experience, winning trophies should be what your career is about. There is just no better feeling. Sligo will want to win this as it’s the one they have yet to get their hands on. They’ve got plenty of players with league and cup medals and they will no doubt want to add this to their trophy cabinets. In comparison, a lot of the Dundalk squad have yet to win anything. As a player, I remember it being a huge monkey I wanted to get off me back. You don’t want to look back on your career and say you never won anything. As I said, you couldn’t have picked two more in-form teams at the moment. From a neutral point of view, we’re all looking forward to seeing these to clubs at their best and if I could pick a game I wanted to go see now, it would be between these two. If I had to call it, I think I would have to go for Sligo. They’ve got that bit of experience and the big pitch might suit their direct play better. That said, I can see it being an extremely close tie and I wouldn’t be surprised if it went to penalties. Email “Stuart Byrne column: If I could pick a game to go see, it would be between these two finalists”. Feedback on “Stuart Byrne column: If I could pick a game to go see, it would be between these two finalists”.